NEWARK — Speaking in the rejuvenated downtown of the city he helmed as mayor for seven years, Sen. Cory Booker (D-N.J.) offered himself as an optimistic and hopeful counterpoint to President Trump who would heal political and social toxicity that Booker said extends far beyond the White House. Like most of the Democrats running for president, he mentioned Trump sparingly in his remarks during his hometown kickoff — and then only as a symptom of a more pervasive problem in American society. Booker, the mayor of New Jersey’s largest city from 2006 until 2013, when he was elected to the U.S. Senate, finds himself solidly in the middle of a presidential pack that now numbers 18. Booker raised more than $5 million in the two months since he announced his bid for the presidency, a number that places him behind other high-profile aspirants like Sen. Bernie Sanders (I-Vt.), former Texas congressman Beto O’Rourke, Sen. Kamala D. Harris (Calif.) and South Bend, Ind., Mayor Pete Buttigieg. 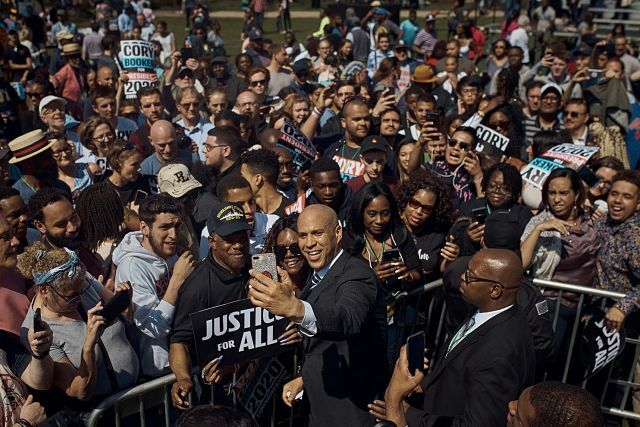 April 13 (UPI) — U.S. Sen. Cory Booker began a two-week tour for president with a “hometown kickoff” Saturday in Newark, N.J., where still has a house and was mayor. A crowd of around 4,000 to 5,000 people, according to police, turned out at Military Park for a campaign stretch billed as a “justice for all tour” — including criminal, economic and environmental. Because the supporters were slow in arriving, Booker’s speech was delayed by one hour, CNN reported. Booker, who was elected senator in November 2012 after serving two terms as Newark’s mayor, announced his candidacy for president on Feb. 1 by emailing supporting with an email announcement. Booker was the eighth Democrat to announce he was running for president. The Democratic field has ballooned to 17 other candidates, including six U.S. senators. He is backed by 3.8 percent of voters, according to RealClearPolitics, way behind 31.1 percent for Joe Biden, who hasn’t announced he is running for president, and 21.2 percent for Bernie Sanders, who ran in 2016 for president. All of the other candidates are in single digits. Booker next plans to campaign in Iowa, Georgia and Nevada. He will be focusing on communities that have been left out, according to his campaign. “We are here today to say, we can’t wait,” Booker said.